These days, “gluten-free” is one of the slyest healthy eating loopholes around. Luckily, I’ve never deluded myself into thinking that a loaf of gluten-free bread is that much healthier than regular bread. But as I discovered during my wellness project, I had, it turns out, been deluding myself that I wasn’t eating a whole loaf of it every week. 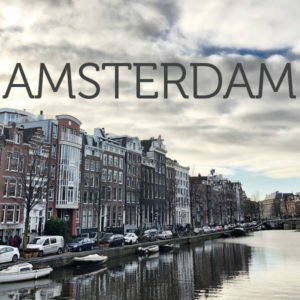 One of my realizations from this year is that I’ve developed a scarcity mindset around my dietary restrictions when I travel. I always do so with a loaf of gluten-free bread in my carry-on, wedged between my iPad and pink fleece airplane socks, leaving a stream of confused airport Quiznos managers in my wake. But after my recent trip to Paris, I think it’s official that I don’t need to compensate anymore. The rising gluten-free lifestyle has up and came. 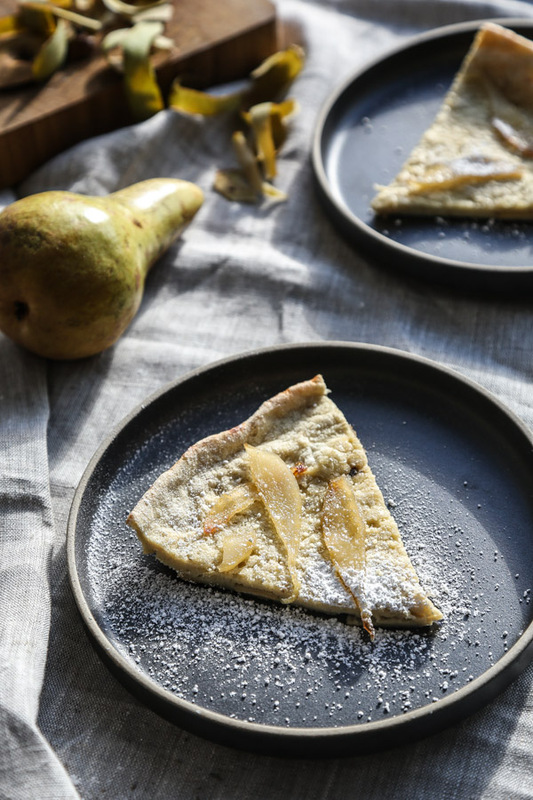 French cuisine is not the easiest for flour-free living, and French culture is not the easiest for requesting a dietary modification without being met with a Mon Dieu and a sneer. 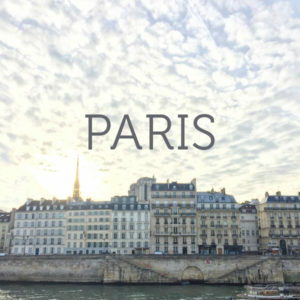 So instead of packing slices of provincial American sandwich bread in my suitcase, I mapped out all the locations in the city where I could find an authentic French loaf and set out to acquire one a few short minutes after my arrival. Over the course of the weekend, I taste tested four different types—a baguette from No Glu, a buckwheat loaf from Eric Kayser, a rustic boule from Helmet Newcake, and a crusty focaccia-like flatbread from Chambelland (written in descending order of preference, from disgusting to excellent). For what I may have lacked in croissants at breakfast and table sourdough to mop up the melted butter at every meal, I made up for in macaroons, almond flour financiers, and chocolate mousse. After three days, it was clear that being gluten-free in Paris did not stop me from some seriously unhealthy indulging. But it also reminded me how fun it is to occasionally do so. Despite the mounting chocolate eclairs in my intestines by the time I got home, and a few combination travel-sugar pimples on my chin, Paris made me want to treat myself more at home so that I don’t have to use a foreign country as an impetus for an over-the-top baked good. 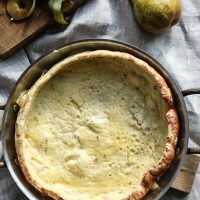 Since we’re getting into resolution/restriction season, I wanted to make room for one last treat in 2016: this gluten-free Dutch baby recipe with vanilla and pear. There’s a different type of scarcity mindset at this point in the year. We need to squeeze in every last holiday indulgence, and to make the last one a decadent hangover breakfast on the 1st of the year, before the daily menu transitions to green drinks and detox soup. This custardy crepe recipe certainly fits the bill. It’s basically like a short stack of pancakes and a ramekin of crème brulee had a baby. But I’m offering it up to you not just as a last unhealthy hurrah, but as a gift you can keep giving yourself all year long. There’s a whole lot of shame that comes with New Year’s resolutions, especially with breaking them. 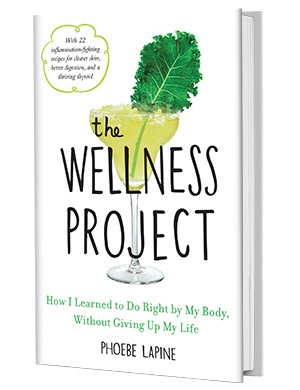 Next week, I’m going to bring you some ideas for how you can design your own wellness project—with actionable short-term goals—so that there are no new overly ambitious rules that end up making you feel like a failure. But I also want to emphasize, since so few people do this time of year, that your new regime should still involve some indulgences. Whatever new leaf you decide to turn over next week, make sure that it will make you feel abundant and not deprived. So in addition to keeping up my anti-inflammatory eating for the most part, my New Year’s resolution also involves bread and pancakes and lots of other glorious carbs! I want to finally try my hand at making my own French boule of gluten-free bread at home (using my friend Ali’s tips), and I want to make my weekend mornings feel luxurious with high quality ingredients, big flavors, and just a touch of sugar. 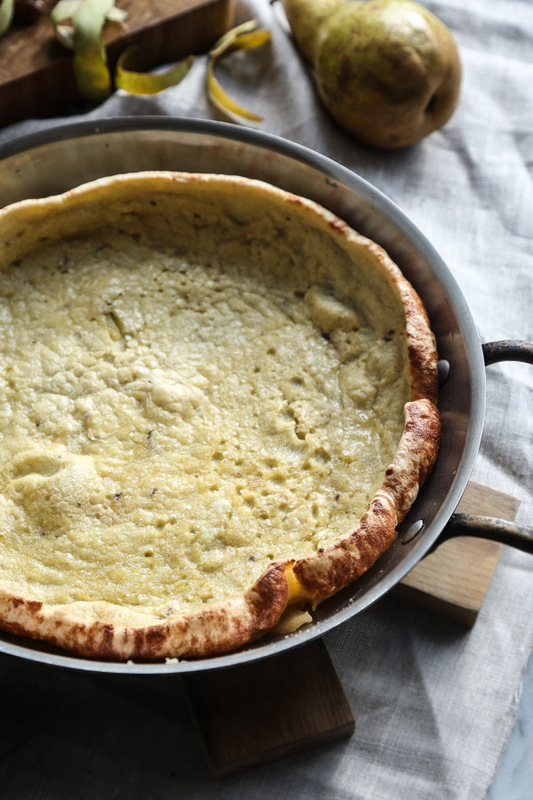 This Dutch baby recipe from Samantha Seneviratne’s cookbook Gluten-Free For Good hits all those marks, and is also so much quicker and easier than any other sweet breakfast dish. 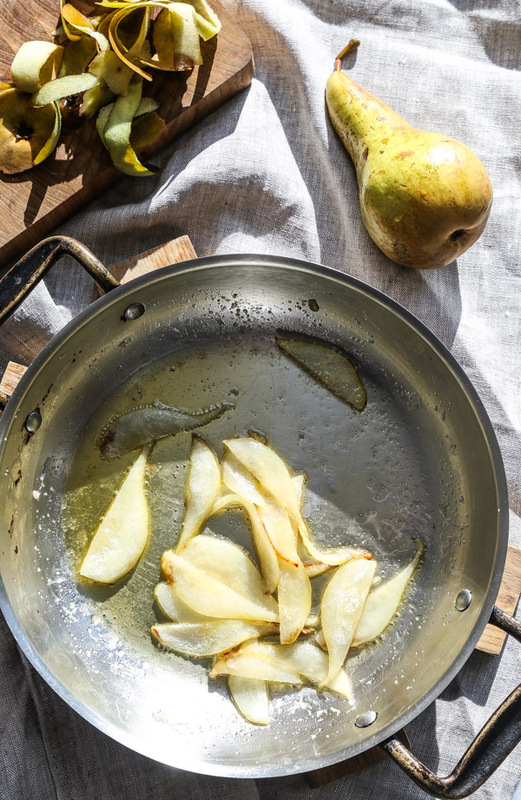 Everything comes together in one oven-proof pan: you broil the pears and fresh vanilla bean with a sprinkle of sugar until it caramelizes, and then pour in the batter—a mix of almond, brown rice and tapioca flour. The latter is a bit more on the obscure side, but I’d highly recommend picking up a bag so that you can add these gluten-free cheese breads to your Saturday to-make list. Samantha (of the blog Love, Cake and also the book The New Sugar and Spice) is a pro baker, so the cookbook also has a lot of other gluten-free recipes you can add to that list. Wishing you all a sweet last few days of 2016, and so much abundant deliciousness in the year to come. I’ll be back in your inbox next Sunday with some healthier ideas for your post-holiday reset and a recap of your favorite FMP recipes of the year—make sure to sign up for my weekly newsletter if you aren’t already subscribed! 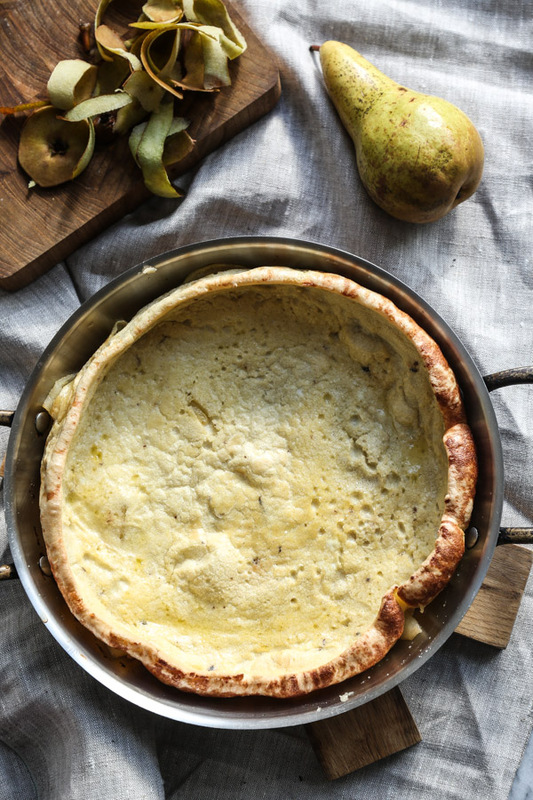 This gluten-free Dutch baby is like Mr. Pancake and Mrs. Crème Brûlée had a baby. It's quick enough for a special, romantic breakfast or dessert for two, and fancy enough to be served to company. The recipe is adapted from Gluten-Free For Good by Samantha Seneviratne. Place a 10-inch cast iron skillet on a rack about 6 inches below the oven broiler. Preheat the oven to 450 degrees F. Meanwhile, in large bowl, whisk together the brown rice flour, almond flour, tapioca starch, and salt. In a small bowl, whisk together the eggs, milk, and vanilla. 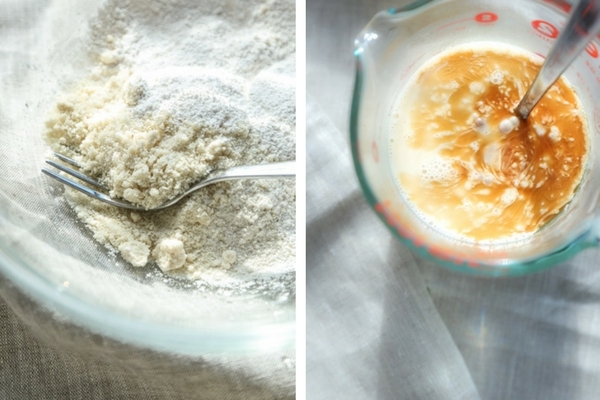 Slowly add the milk mixture to the flour, whisking until smooth. Set the batter aside. After about 20 minutes, when the skillet and oven are hot, carefully remove the pan and switch the oven to broil. Add the butter to the hot skillet and swirl it around. Sprinkle the sugar evenly over the butter. Add the pear slices and vanilla bean seeds and toss to coat. Return the skillet o the oven and broil until the sugar begins to caramelize, stirring halfway though, 4 to 5 minutes. Remove the skillet from the oven and turn the oven temperature back to 450 degrees F.
Whisk the batter and immediately add it to the skillet. 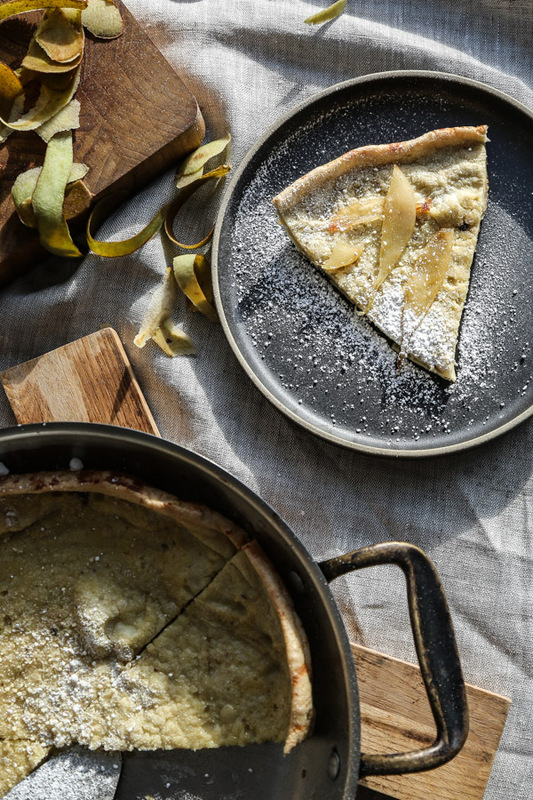 Return the skillet to the oven and cook until the Dutch baby is puffed and set, about 12 to 16 minutes. Sprinkle it with confectioners’ sugar before serving. I used almond milk instead of whole milk, and ghee instead of butter. I forgot to add the vanilla to the pears so I put it right in the batter--either way works! Thanks so much, Phoebe! Here’s to treating ourselves at home more in 2017. I guess there’s no way of making this with maple sugar or agave? I really have to stay off cane sugar. You can definitely use maple syrup. Agave is very high in fructose, much more so than cane sugar. Is there a reason you’re avoiding one but not the other? Hi! I’m so excited to try this recipe. Is there anyway to make it correctly and sub out the butter for something dairy free? yes! try it with coconut oil!